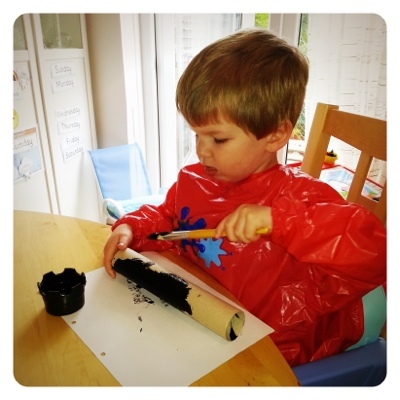 We've been sent a few pirate items to review lately and it's prompted me to have a week of pirate activities. No pirate captain can be taken seriously without a looking glass. It's also the easiest thing in the world to make! Paint the tube black and leave to dry. Paint three gold rings around the tube, an inch from each end and one in the middle. This will help it look like it's one of those sliding ones. Use the metallic pens* to dot gold and silver patches over the other sections for some extra 'pirate bling'. Once dry, glue around the very tip of each end and cover with gold foil. Leave enough to foil to bend over and glue on the inside of the tube; we don't want scratched faces or eyes! 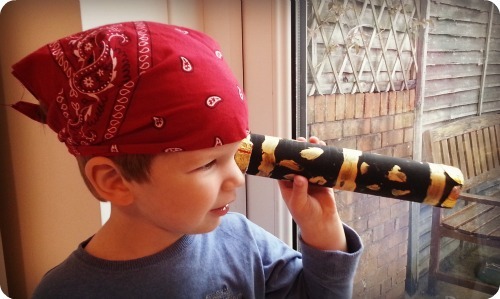 If you want to see another brilliant pirate spyglass, nip over and check out this 'How To' from the marvellous pirate mummy, Multiple Mummy. I was sent the item marked * by Yellow Moon to see what I could do with it. I'm going to be sharing a few pirate activies this week. If you've got anything pirate that you'd like to share, please add it to the linky below to create a great reference for me and others. Oh how fab me hearties!! Fabulous idea & the finished spyglass is fantastic. What a cute little pirate. i love the idea of a resource of pirate posts! Great idea…I really hope Z loves crafts too!